●	Arizona Competes Fund: Checkbook-level, downloadable, projected and actual public benefits. ●	Arizona Jobs Training Program: Checkbook-level and downloadable. ●	Military Reuse Zone: None. ●	Quality Jobs Tax Credit Program: None. ●	Research and Development Tax Credit: None. Having a state website dedicated to spending transparency is a good thing, but not enough people pay attention to it, and government officials have too many ways around it, an open-government advocate said Wednesday. “People need to be involved as they possibly can be,” said Byron Schlomach, director of the Center for Economic Prosperity at the Goldwater Institute, an organization dedicated to free enterprise and limited government. 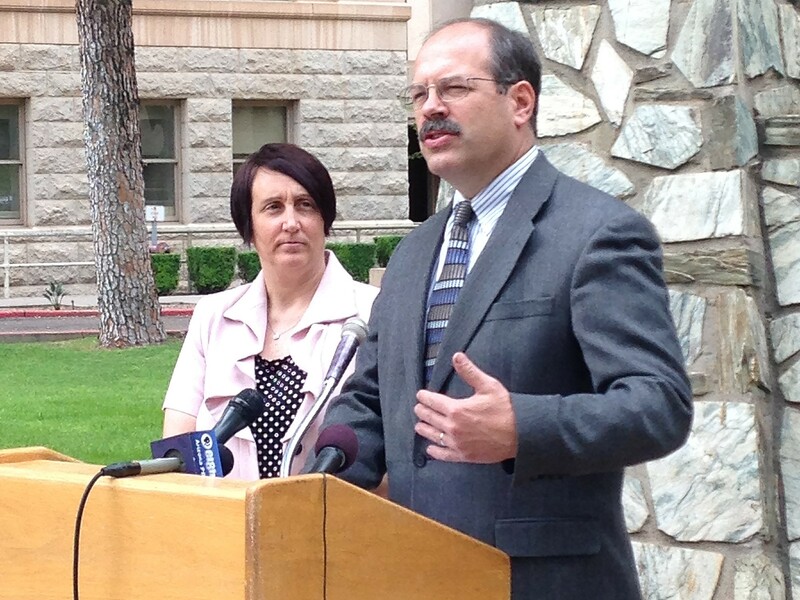 As part of Sunshine Week, a celebration of open government, Schlomach and others held a news conference about a Public Interest Research Group giving Arizona a grade of B in spending transparency. The annual Following the Money report praised Arizona for providing data about the state’s largest economic-development programs through OpenBooks website but dinged it for not including checkbook-level detail about all of them, including those offering businesses tax credits. Diane Brown, executive director of the Arizona Public Interest Research Group Education Fund, said her organization is focusing this year on getting the state to provide this detail to the public. Brown said along with spending data, the transparency website should provide people with projected and actual public benefits of economic- development subsidies. “We need to make sure that all taxpayer expenditures, especially in tight budget times, are available for public scrutiny and for lawmakers to make decisions that are going to be in the best interest of the public,” she said. Schlomach said the public needs to pressure lawmakers to improve transparency. “A lot more people would need to be looking at the transparency website,” he said. Schlomach said though some departments like the Arizona Supreme Court are extremely responsive to questions about how their money is spent, others are less open. “As people look at these things and they ask questions, it pushes the various departments that aren’t up to snuff to improve,” he said. Schlomach said laws need to be changed as well, including one that excludes salaries from the transparency website. He said another law allows local governments to get around transparency requirements by posting a certificate of good financial reporting given by the Governmental Finance Officers Association. “Many cities and other local governments in this state use that loophole. That’s in our state laws. That needs to be changed,” he said. State Comptroller Clark Partridge said the PIRG report provides an opportunity to work with local governments and the public to improve transparency. “There are many good efforts by local governments and by the state as a whole to make transparency a priority,” he said. Partridge said improvements come in seasons, when there is more focus and after the state addresses other priorities. Released during Sunshine Week, the annual Following the Money report praises Arizona for providing data about the state's largest economic-development programs through its OpenBooks website. But it criticizes not including checkbook-level detail about all of them. Byron Schlomach, director of the Center for Economic Prosperity at the Goldwater Institute, and Diane Brown, executive director of the Arizona Public Interest Research Group, hold a news conference Wednesday on a report giving Arizona a grade of B in government spending transparency.